Subject: SSC Advanced Supplementary Examinations, June, 2018 - Communication of schedule of due dates for remittance of Examination fee / submission of failed candidates extracts etc., by the Heads of Secondary Schools - Certain instructions issued - Regarding. The SSC Advanced Supplementary Examinations, June 2018 are scheduled to be conducted in JUNE 2018. The examination timings are from 09:30 AM to 12.15 Noon. The Examinations will be conducted only for the candidates who registered and failed and who were absent in the SSC Public Examinations, held in March 2018 and no fresh candidates will be permitted. I am communicating herewith the schedule of due dates for remittance of examination fee without penalty and submission of Nominal Roll extracts of failed candidates by the Heads of Schools / District Educational Officer concerned to this office for the ensuing SSC Advanced Supplementary Examinations, which will be held in June, 2018. The Computerized Nominal Roll extracts will be dispatch to all the schools. 1) To give wide publicity regarding the due dates of remittance of examination fee by all the failed candidates printed In the extraction of nominal rolls and collect the fee from them without fail. 2) To display "Due Dates" information on the NOTICE BOARDS of the Schools and give wide publicity for information of the candidates / public by publishing in the local newspapers and through available media. 3) If any of the failed candidates are not accessible, efforts may be taken to intimate the candidates through whatever means possible as per their Residential addresses, about the due date of remittance of fee immediately, so that they may not lose the Chance. 4) Not to add any fresh names of the candidates in the computerized extracted nominal roll of the failed Candidates or any changes effected in any of the particulars printed in the extract. 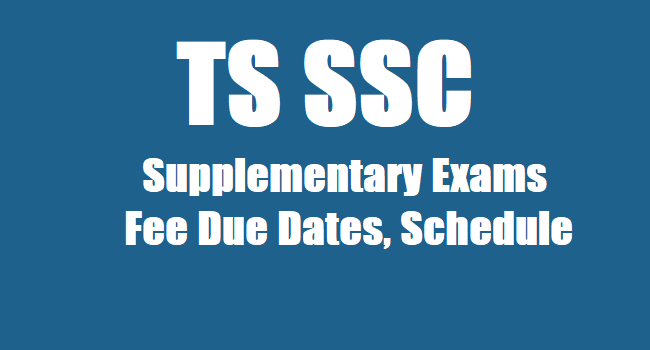 5) Not to collect the examination fee from any candidates other than those whose names are printed in the extracted nominal rolls of the failed candidates and supplied to the schools, as only the failed candidates of SSC Public Examinations March 2018 are eligible to appear for the SSC Advanced Supplementary Examinations, June, 2018 either for New Syllabus or for Old Syllabus and also to collect fee only from such of those candidates who have been permitted by Director of Government Examinations, T.S., Hyderabad. 3. Last date for submission of Computer extracts by the Headmaster in the DEOs office. 4. Last date for submission of Computer extracts by the DEOs in the O/o DGE., T.S., Hyderabad. 5. With late fee of Rs 50/-: Up to 2 days before commencement of exam in their subject concerned.